It took quite a bit of planning (at least 3 orders for delivery). Gathering up ChubbyLunchBuddies, coordinating with delivery time and place on a rainy day, plus horrible traffic/parking. The exchange happened at the corner of 48th & 3rd Ave, where I was instructed to find a “yellow bag” in a sea of umbrellas and black overcoats. Even through the rain and chaos, every component arrived intact. The anchovies and peanuts were crispy, the shrimp crackers crunchy and the cucumbers fresh. The chicken and rice was a bit luke warm, but we were too hungry to wait another 30 seconds for the microwave. The coconut rice was a bit different than the ones from the restaurants. Longer grain with shaved coconut strips, it was ok, but I like the more fluff and plump rice. The fried anchovies were fantastic, one of my favorite parts of the meal (I wish I could buy that by the jar full and sprinkle it on everything). The natural oil, saltiness and crunch along with whole fried peanuts. The chicken rendang had tons of spices – anise, cardamon, kaffir lime leaves, tumeric, ginger, lemongrass, garlic and a kick, plus a hint of coconut. Flavorful and tender, that sauce was perfect for the rice and egg. Anchovy sambal (the red stuff) had more of that awesome fried anchovy (natural umami), with shallots, onions and chillies. Don’t let the sweetness fool you, it can get quite fiery in your mouth. I’d be happy with just a spoonful over rice any day. 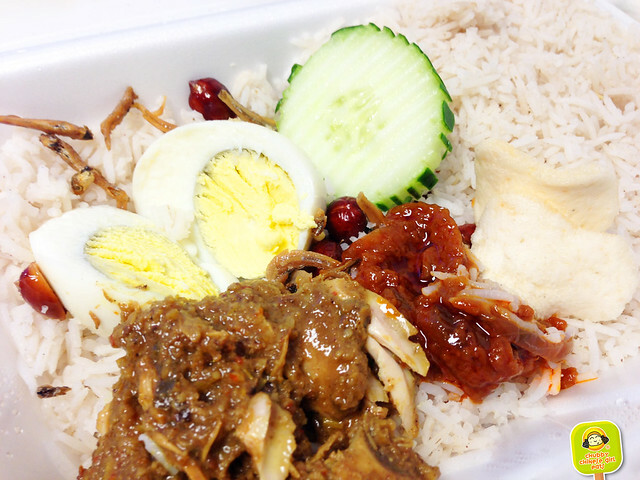 I’ve never been to Malaysia so I won’t know how “authentic” this is, but from the Nasi Lemak I’ve tried in NY, this is a step above the restaurant versions. Plus, before delivering to my office, they dropped off lunch boxes at the Malaysian Consulate in NY, who I’m sure know a thing or two about their food. A homemade “exotic” lunch to spice up a weekeday, ohhh hell yeah! I see myself ordering again and again. For $7 the portion was very generous. I ordered an extra one for dinner, heat it up and it was just as good. So even if you can’t get others to join you for delivery, you can always order a couple and save it for the week. Check their Facebook page for the next delivery date and menu.